Welcome back! It has been a while since I had time to sit down and write Part 2 but if I recall correctly, I left off with a running and legal car after major surgery to rebuild the frame. So now with a working car, we begin Part 3. A word of caution, there are few photos in this entry as I did not think to document the repairs at the time. The joy of having a convertible (my first one besides a 24 hour loaner for senior prom) was truly something glorious. I drove the car everywhere, enjoying the wind in my hair, the sunshine, and the attention that the car got. 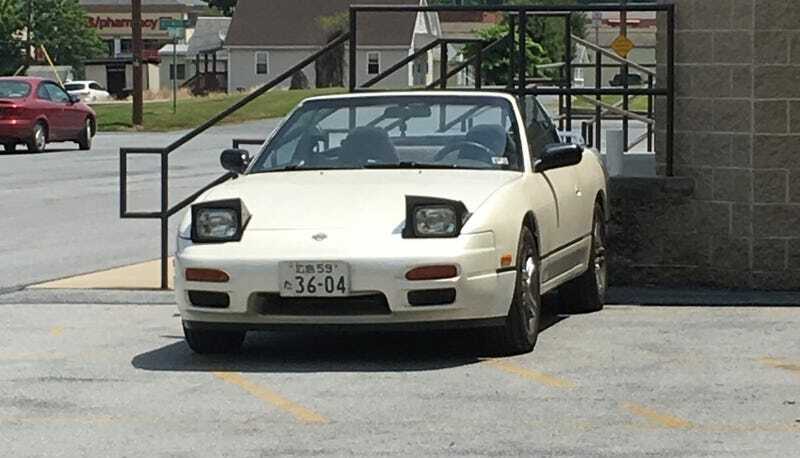 I was surprised just how many people noticed the car and, honestly, how many realized how rare the 240SX Convertible is. I would get people leaning out of their windows at stoplights to tell me “Hey! Clean 240!” or stop me in a parking lot and tell me “Wow, I’ve never seen one of these in person before.” Going to a local cruise-in night (at an Amish market of all places) became a weekly event for my girlfriend and me. We were living together at that point and we used the car any time we could. Trips to Hershey PA, visiting my parents, even mundane chores, the 240 was the car of choice. With the car sorted and being a responsible adult, I decided it would be a great idea to commute to and from work in the convertible. Although loud at highway speeds with the top down, the car had just barely enough grunt to merge with traffic and an exhaust note that, for a 4 cylinder at least, was pretty intoxicating at full tilt. The car made the drive to and from work something enjoyable instead of a soul crushing event. It may not have had a radio in it but I could have fun speeding along past semi-trucks and basking in the sunshine in an effort to forget the stress of my job. Even on rainy days, the openness of 90's-era car design was refreshing, and the fact that I fit better in the convertible than the coupe was a nice bonus. The 240 ran beautifully from July into early October. Besides an issue with starting, thanks to a poorly wired security system, the car was well behaved and fun to live with. By mid October I had begun to think the car was reliable and all I needed to finish it was to replace the missing radio. I had no idea of the headaches in store for me. Driving home one evening the car began to buck and pop. I would put my foot down and the car would not react for a moment, then it would rev up. I pulled into the nearest gas station and shut the car down. Opening the hood I did not notice anything amiss so I started the car back up. It ran rough with a weird lopey idle, and the sound was...well, wrong. I had been driving this car for months and the exhaust note had changed, it was deeper and uneven. Springing into action, I called a co-worker I knew was working late and asked him to bring me some shop tools on his way home that night. In the meantime I began to try and diagnose the issue. Realizing it was something related to the motor, I began to run through the engine triangle. Fuel - Air - Spark. A running engine needs all three of those things (plus compression, but you can’t easily check that in the parking lot) in order to work. Lose one and the engine stops running properly. Whenever you are having engine troubles always check Fuel - Air - Spark. These are words to live by. Air was the easiest to check so I started my diagnosis there. Air filter look Ok? Check. Unplug and re-plug MAF? Check. Any obvious vacuum leaks? Nope. Still runs like crap. Ok, so the issue is probably not related to air. Next up, check for spark. Start pulling spark plug leads. Cylinder 1. Runs rougher, plug back in. Cylinder 2, same. Cylinder 3, same. Cylinder 4, no change. Bingo. Cylinder 4 is dead for some reason. I had finally cornered the gremlin, now to get rid of him. By this point in time my coworker had arrived with the tools I needed so I turned off the engine and proceeded to pull the spark plugs. All 4 plugs looked fine and there was the a very very light smell of gasoline on all of them. To check for spark, I put a plug into one of the plug wires and held it against the head of the engine. I had my co-worker crank the engine over and watched for the spark. The plug from cylinder 1 threw a nice strong spark. That was a good sign. The same thing happened with the plug for cylinder 2, and cylinder 3, and, oddly enough, cylinder 4. Crap. So far I had figured out that I had air and I had spark, so that meant I did not have fuel. Oh joy of joys. After putting the plugs back into the motor and saying goodnight to my co-worker, I started the engine again. It continued the same rough idle so my poking around hadn’t magically fixed the engine like I hoped. I pulled the plug wires again to confirm that cylinder 4 was still inoperable and, confirming it was still broken, I proceeded to diagnose the fuel issue. To check if the fuel injectors were working I took a socket extension, set it on the cap on top of the injector, and placed the other end right in front of my ear. This allows one to hear the little tapping noise of the injector firing. Cylinder 1 had an injector happily clicking away. Checking cylinder 2, yep, that’s clicking too. Cylinder 3? Clicking as well. Cylinder 4? Nothing. After about an hour in the gas station parking lot I had finally found the culprit. One phone call to the local auto parts store and I began the job of limping the car on 3 cylinders back onto the highway, up one exit, and to the store. They had a single fuel injector in stock and I proceeded to replace the dead injector right there in the parking lot. By this time it was now dark and getting cold enough that my hands were starting to hurt. But I could not get home until I had the car running. For those who do not know, Nissan used some odd side feed injectors on the 240SX. They are held into the fuel rail with a cap and Phillips head screws. An 18 year old car makes the removal of these screws difficult in the best of times and can drive one to drink when its 8:00 pm in a sketchy part of town trying get a car running so you can get home. A bottle of PB Blaster, hammering on the screws with the socket wrench and extension, 20 minutes of my time, and some choice swearing were required to get the 2 screws out. Utilizing a flat blade screwdriver, a pair of vice grips, and more swearing I managed to extricate the offending fuel injector and unceremoniously shove its replacement into place. Reconnecting the harness, the car started up and ran fine. Not wishing to push my luck, I slammed the hood closed and rushed home. The next morning I awoke and went to leave for work. I turned the key and, lo and behold, it was running on 3 cylinders again. Whatever I had fixed the night before had broken again. I ended up working from home that day and spent the next weekend trying to diagnose the issue. I disassembled the fuel rail thinking maybe it was the fuel pressure regulator, and soon it became too cold to work on in the unheated garage. Soon life got in the way and the car sat in the garage, partially disassembled and ignored. My girlfriend and I settled into a routine, we bought a house, I proposed to her, and we moved. I ended up having the non-running car towed to the new house on a roll back and dumped into our new garage where it continued to sit. We got married, we had a daughter, I built a deck on our house, and life moved on for everything except the 240. I can’t fix cars but I can build a deck! Required photo of baby. She may get the 240SX when she is older. Before I realized, 4 years had passed and the car was still sitting in the garage. It had been listed on craigslist a few times but never had any bites beyond the “Can you sell me the tonneau cover on its own?” My response of “No, but I’ll sell you the tonneau for $2,000 and I’ll throw in the car for free.” usually ended the conversation. At that time I had also decided to sell off my coupe and turbo motor as well. As luck would have it, my cousin and his half brother were into 240s and wanted to buy my stuff. While discussing the sale of the turbo motor, I mentioned to him the issues with my convertible and he said “Oh, that’s a known problem. The injector harness fails. Get a new harness and you’ll be good to go!” I am fairly sure I still have a cut on my chin from my jaw hitting the floor when he told me that. Somewhere in here is a single broken wire. I promptly ordered a new wiring harness from Wiring Specialties and spent a weekend with my father meticulously disconnecting the old harness and snapping the new one in. We took our time and made sure all of the wires ran exactly like factory. By sunday afternoon we were ready to test it out. I hopped in the car, turned the key, and the engine cranked. And cranked. And cranked. PRODUCT PLACEMENT - I’m hoping this works like a scarecrow. I had forgotten to put the fuse for the fuel pump back in after removing it during the initial tear down 4 years prior. With the fuse installed correctly, the engine fired up and off we went for a test drive. All of the joy this car created came flooding back and it wasn’t long before my wife begged me to let her drive. We took it down to the gas station and I snapped a photo of her in the car. With the gremiln chased out of the fuel injectors, the car ran reliably and became my commuter car once again. My co-workers we happy to see it on the road and the commute became enjoyable once more. Every now and then the gremlin pops his head back up again, but all in all it’s a good car. Now that the car ran once more it was time to make my mark on it with some tasteful touches. I wanted to restore it close to factory but there are a few things that Nissan didn’t offer in the car that I wanted. But that is a story for Part 4. Which is now here! So convenient!